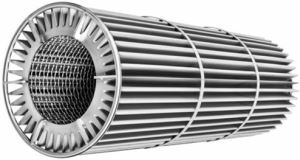 The HEINKEL Group offers a wide ranging line of pleated multi-layer metal dust filters for GEA/Niro MP7 & MP8 model units along with Glatt and other brand fluid bed dryers. These style filters can also be used for different styles of vacuum dryers that include Conical, Nutsche, Pan and Paddle. Compared to felt or woven fabric filters Multi-Layer metal pleated filters provide many advantages. They require less pulse cleaning, provide a much higher level of sterility as there are no fabric fibers or sewing thread, the filtration area is up to three times larger, and giving lower total operational costs.